These are some of the most attractive bulbs for the late spring garden, but are not often available from bulb supply companies. These bulbs are among the easiest to grow from seed, and although it may take a few years before you see you first blooms, you will be rewarded handsomely when they do flower. Height 16 inches. 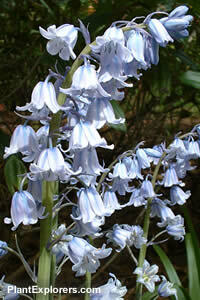 The genus Hyacinthoides is now in the family Asparagaceae. For maximum freshness, please keep seed refrigerated in its original packaging until it is time to plant. Sow seed in a cool greenhouse or cold frame in spring. Grow on in any good garden soil with good drainage. Bulbs will attain flowering size in 2-3 years.